Hereford FC manager Peter Beadle has had a 48 hours to remember after becoming a father for the fifth time - just two days after leading the Bulls to Wembley for the first time. The reborn club who grew out of the old Hereford United's demise in December 2014, are still in their first season. But they have done something the old club failed to do by reaching Wembley, beating Salisbury in the FA Vase. And Beadle topped it on Monday when his other half gave him a baby daughter. 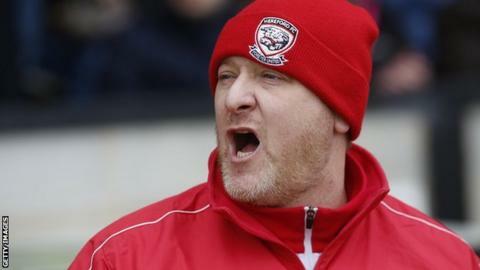 "It has been a real rollercoaster of emotions," the Bulls boss told BBC Hereford & Worcester. "A double celebration. "It's our second child, but my fifth. It has been a massive couple of weeks." Hereford went into Saturday's FA Vase semi-final second leg with a 1-0 lead from the first leg at a full-to-capacity Edgar Street a week earlier. The tie was hauled back to 1-1 when Stephen Walker levelled for fellow Phoenix club Salisbury, managed by BBC Sport pundit Steve Claridge, on 18 minutes. But, five minutes before the interval, Mike Symons turned in Ross Staley's cross at the far post to restore their advantage. And, with 11 minutes left, substitute Joe Tumelty turned to hit the winner into the bottom corner to allow their Bulls' 650 travelling fans to celebrate. "There was a lot of bleeping at half-time," admits Beadle. "We were disappointed with how we'd played but it was a lot better after the break." Peter Beadle was Hereford United's last manager when the old club was wound up in a London High Court in December 2014, six months on from a disastrous takeover. But, when a new club was formed by fans, they immediately turned to the man who had supposedly saved them when he inspired the old club to avoid relegation from the Conference Premier in April 2014, winning at Aldershot on the final day. "Saturday's win at Salisbury was fantastic," said Beadle. "Up there with that day at Aldershot two years ago. But it's still back to work on Tuesday as we've got a game to prepare for. Although the Bulls will now enjoy a day out at Wembley, they have slipped five points behind Midland League title rivals Alvechurch. But their fate is in their own hands as Hereford have two games in hand and the two clubs meet at Alvechurch on Easter Monday. "I've demanded we win all our league games between now and the end of the season," added Beadle. "I hope they come in massive numbers to Wembley and we'll show what we're about as a club. But the league is what matters most. We have to get out of this league." Who do the Bulls play at Wembley? Hereford will be up against north-east side Morpeth, who needed a 93rd-minute volley from Luke Carr to see off Essex League side Bowers & Pitsea. Having let a two-goal lead slip to draw 2-2 in the first game a week earlier, Morpeth were back in front in the tie after just four minutes through Sean Taylor, only for Lewis Manor to equalise again on the stroke of half-time. But, after the visitors were reduced to 10 men when Ross Adams was sent off, Luke Carr volleyed the winning goal three minutes into stoppage time. That sets up the first in a two-match treat for lower-level football fans, who can head to watch four teams in action at the first Non-League Finals Day on Sunday, 22 May, when the FA Vase and FA Trophy are played back to back for the first time. The 2016 FA Trophy final will be between National League sides FC Halifax Town and 2013 beaten finalists Grimsby Town. Grimsby, who led Isthmian League high-flyers Bognor Regis 1-0 after the first leg, went through 3-1 on aggregate thanks to two goals from Mariners top scorer Padraig Amond. After Amond's eighth-minute penalty, Dan Beck levelled for Bognor on the day five minutes later, but Amond got his second 12 minutes from time to complete a 2-1 second-leg victory. They will meet Halifax, who were held 2-2 by another seventh-tier side, Northern Premier League Nantwich Town, but go through 6-4 on aggregate. Jordan Burrow's brace on the day was cancelled out by goals for the Dabbers from Liam Shotton and Matt Bailey. Grimsby and Halifax will meet in the second instalment of Wembley's first all-in Non-League Finals Day on Sunday 22 May.